Most of you are probably already familiar with the different tools that are available to use while editing your images in post-processing software. I’m referring to the various brushes and filters that can be found in Lightroom, Capture One Pro and other similar programs. Well, did you know that in addition to using these tools to adjust things like exposure and saturation, you can also use them to add a bit of color to your images? In this post I’ll show you a few of my favorite ways to use these tools along with some subtle additions of color, which will make your image editing a bit more colorful. Keep in mind… I’m a Lightroom user, so I can’t promise that these techniques are available in all post-processing software. 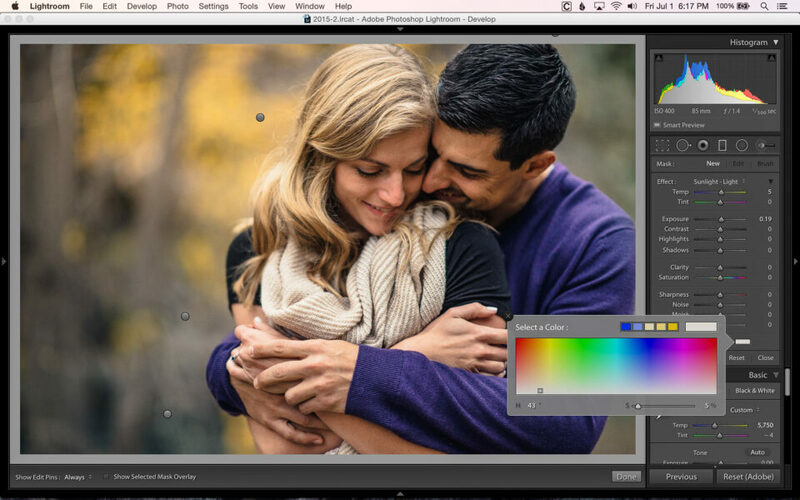 In Lightroom, it’s very easy to add a bit of color to the tools that you’re already using. I’ve talked with photographers who never even noticed that there’s an option to add color while editing a tool’s effect. 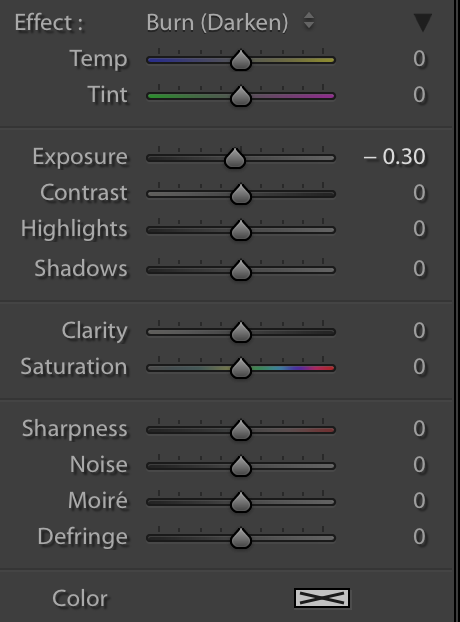 In Lightroom, this works for all of the tools that use effects, including the Graduated Filter, Radial Filter and Adjustment Brush. To add or adjust color, click on the grey box with an “X” on it next to the word “Color”. A color picker will pop up. From here, you can manually choose a color by clicking anywhere in the box. You can also manually set a hue and saturation by entering numbers in the “H” and “S” values at the bottom of the box. Finally, you can use the eyedropper tool to sample a color that’s already in the image by clicking inside of the color picker box and dragging the eyedropper onto the area of the image that you you want to sample. One of my favorite ways to use color in my images is to enhance colors that are already there. When would you want to do this? I typically do this to foliage that I want to make look a little more lush, but you could just as easily use this technique on a blue sky or even on warm sunlight. Take this image for example. As it is, it doesn’t look too bad, but I thought it needed a bit more color and that the focus needed to be shifted a bit more to the couple. Can you tell what was done? To start, I added two graduated filters to darken the lower-left corner of the image. I find I prefer to add a few smaller filters (especially when burning) that are staggered instead of one strong filter. This allows me to stagger the effect a bit more than I can with only one filter. Once that was done it was time to add a bit of color. On the upper-left corner of the image I added a graduated filter increased the exposure just a bit, as well as a slight warming of color temperature and a touch of yellow color. On the upper-right corner of the image, I reduced the exposure just a bit and added a touch of green. Here’s the image of the different pins for the graduated filters, as well as the settings for my “Sunlight-Light” preset that was used in the upper-left of the image. You can also add colors to a scene in order to enhance what is already there. You might remember this image from our How Was This Picture Made series. Take a look at the before and after and then I’ll explain what I did and why. You should be able to tell that I added some green to the left side of the image and some warm, red color to the right side of the image. Again, this was done because I felt that the original image was a little flat and that adding a bit of color would really make my subject stand out. The green on the left essentially mimics the trees that are behind him (which lost most of their color due to the flare), while the red/yellow on the right enhances the flare of the sun bursting through the trees. 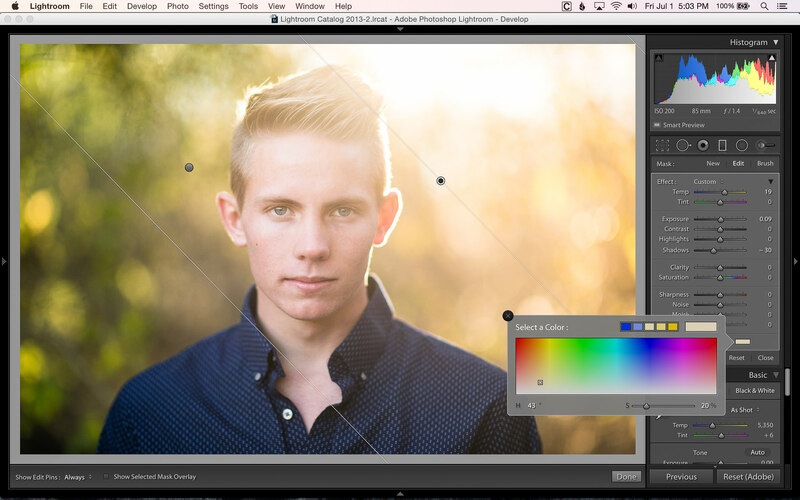 Don’t feel like you’re limited to only using the graduated filter to add color to an image. You can add color with the adjustment brush and radial filter as well. Here’s an image where I used both the graduated filter and radial filter to add color. Can you tell what was done? By now, you could probably tell that I used a graduated filter to both darken and enhance the greens in the image. I also used the radial filter to add a nice, warm patch of light coming down on my subjects. 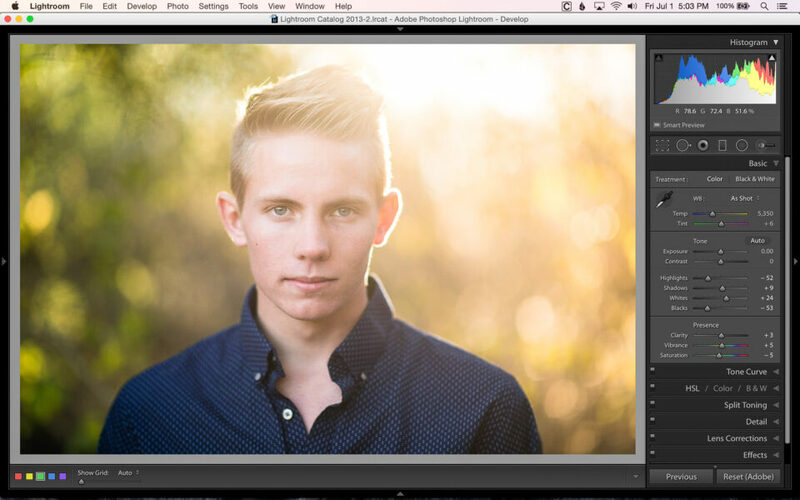 To do this, I chose the same “Sunlight-Light” preset that I used in the first image. I first inverted the mask so that the effect would apply to the area inside of the filter and not the entire image. Then I added the filter so that the “light” just washed over them, imitating the effect of some nice, warm light spilling through the trees. I could have just as easily used the adjustment brush to do this and had a similar result. Once you start using this technique, you’ll find it hard to stop, but don’t get too carried away! For example, when adding color into a scene, you’ll want to be careful about “spill”. In this image, I made sure to erase the green and red off of my subject using the erase brush in the Graduated Filter tool. Here you can see the mask for the green graduated filter. If I hadn’t erased a portion of it, it would have gone across his face, tinting it green. Another thing you’ll want to be careful of is using too much color. The point of adding color is to enhance the image. Adding too much color, or the wrong color, can easily detract from the image. In this image, the before is my original edit, with just enough green and “sunlight” to improve the look of the image. The after has an over-saturated sunlight effect on the right and the red on the left doesn’t really work with the image, even though the bush on the left does have a bit of red in it. I hope that you’ve found this introduction to adding color to your images informational and helpful. Once I realized that this was possible, I found myself using it in on many images from every session. Regardless of what type of photography you do, hopefully you’ll be able to use these techniques and add a splash of color to your images as well! 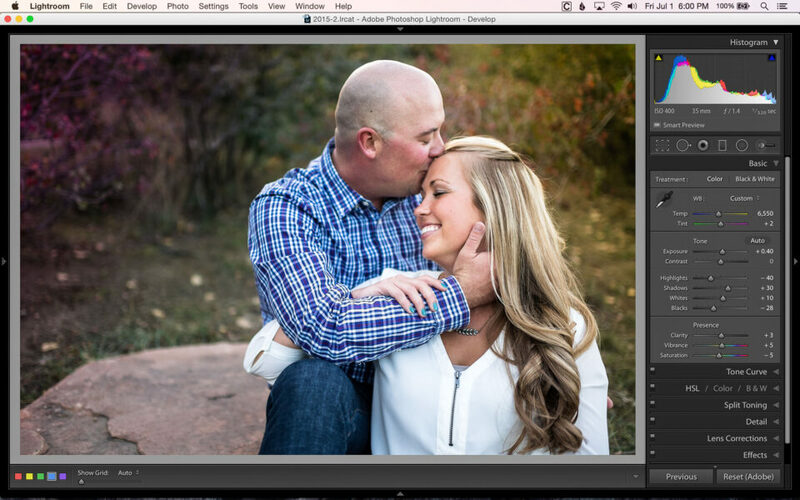 John Bosley is a wedding and portrait photographer in Denver who loves creating authentic, emotional images with his clients. He has a soft spot for functional antiques. You might see him writing with a fountain pen from his collection or shooting with one of his many film cameras. You can view his work on his website or see what he’s been up to lately on Instagram. 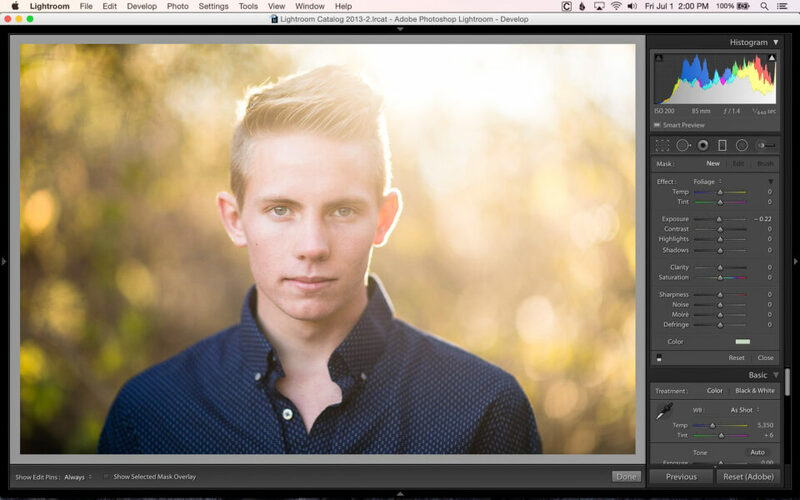 John, this was a helpful and timely article for my Lightroom journey. Thanks for sharing this useful tool. Glad you found it helpful Frank! Thanks, John. The “best” thing about these tips/results is that they are very subtle, yet still accomplish the goal of improving the image. That’s exactly how I feel about this as well, Jim. In my opinion, subtle is good! Thanks for the tip. I never thought about adding color this way. 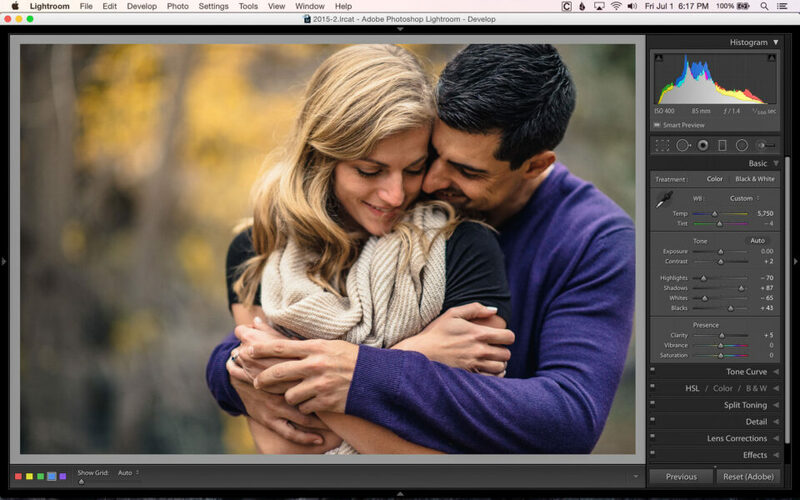 I use Capture One instead of Lightroom so I hope I can find something like this in that software. Cees, I hope that you can as well. I did install Capture One and tried to figure out if this was possible, but I couldn’t. I don’t know if it’s because I’m not familiar with the program or because it’s not possible, so hopefully you have better luck than I did! Hi John, it is not possible in C1 (Itried). 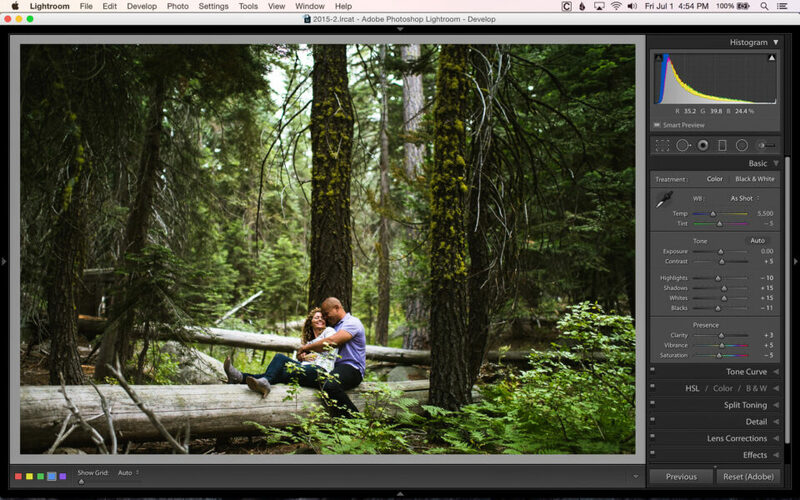 I use Lightroom for quick processing so I can import the Tiffs in Lightroom and use the tool. No problem, I convert to Tiff usually first to do some editing in On1 or other software depending on my needs. Adding a slight color in a subtle way can be very usefull. Thanks for the tip anyway. Darn! I was hoping I just didn’t know how to do it. Thanks for the update! Wow. I thought that I knew Lightroom quite well. I am humbled. You have made a huge difference in my capability. Thank you! You’re very welcome, Art! I’m glad you found it useful. Learning a new technique is always a lot of fun. Enjoy! Thanks John – a great article. How do I get the options within the Effects Panel. When I select the Adjustment Brush, I only have a single adjustment slider. The range of options (ie exposure, highlights, clarity etc) shown on your screen shot are not visible, neither is the colour option button. Thanks Nigel! That’s very strange. Are you using Lightroom? Which version? Are you sure you’re selecting the adjustment brush and not the spot healing tool? Try pressing “K” (the keyboard shortcut for the adjustment brush) and see what happens. I have done these kind of adjustments in Lightroom, but you may want to try On1 10 effects. It is especially good for working with an image with a foreground and background because of its quick mask feature. One thing I found is that you can edit by color range. For example – if you want to adjust the sky behind tree branches you can select a blue “range” in a brush and just change the sky behind the branches. It seems that each tool seems to have strengths for each adjustment type. DxOptics and Capture have their strengths as well. So true, Steve. Although Lightroom is useful for doing a lot of different things, it definitely isn’t the best tool out there for selectively adjusting colors within an image, especially using the adjustment brush tool. Thanks for the suggestion! That’s great! To tell you the truth, I never even noticed that there was a drop down triangle there, so you taught me something as well! Wow, is putting it simplistically. These are hidden gems that I didn’t even realise exist in LR. Until you indicated it, I didn’t know there are more settings for each of Graduated Filter, Radial Filter and Adjustment Brush. One question though. All these post processing tools though, would you say they are “killing” traditional photography skills? A photographer is now able to take a completely horrible photograph but then use software to embellish it to the point it looks fantastic. Glad you found a few things you didn’t know about! I don’t think that the post processing tools we have available to us today are killing traditional photography skills. A horrible photograph is still a horrible photograph, regardless of how much post processing is done to it. If anything is “killing” photography skills, it’s super-smart cameras that do all of the work so that photographers don’t have to think about settings and simply have to press a button. Of course, I don’t personally believe that modern cameras are a bad thing, but if you want to blame something for killing skills, don’t blame the software, as (in my opinion) it takes quite a bit of skill to do well.